Specifically written for the Bayreuth Festspielhaus, Parsifal became Wagner’s final and farewell work to the world completed in January 1882 and first seen in that year. 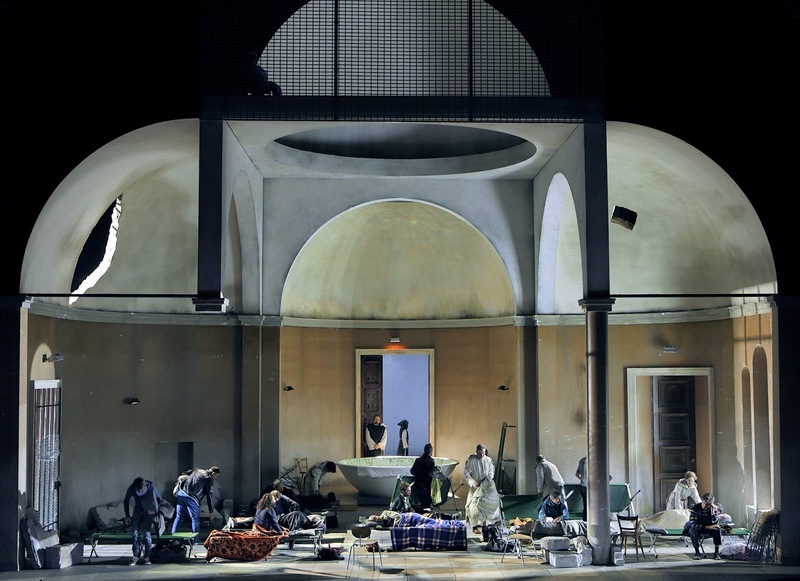 This production by German director, Uwe Eric Laufenberg (Intendant des Hessischen Staatstheaters Wiesbaden) marks its tenth outing at the Bayreuth Festival since its première (seen on 21 August 2017). 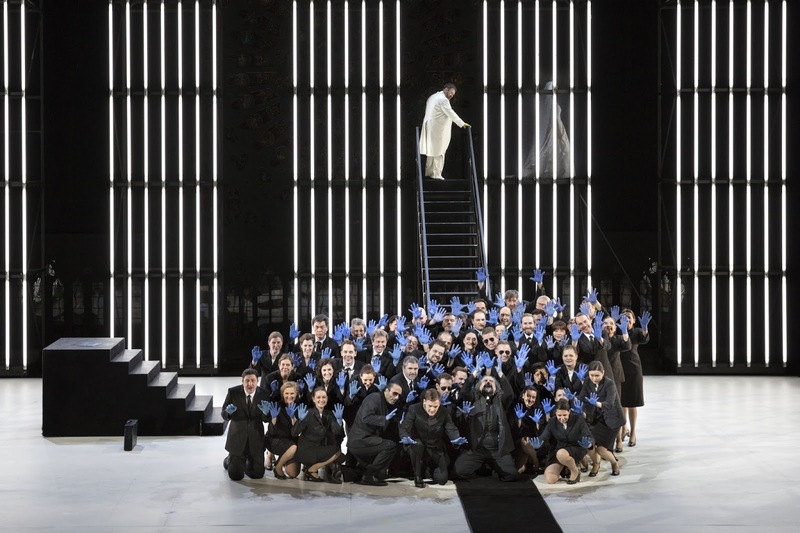 Hartmut Haenchen conducted, with a cast including Karl-Heinz Lehner, Ryan McKinny, Elena Pankratova, Andreas Schager, Derek Welton and Georg Zeppenfeld. 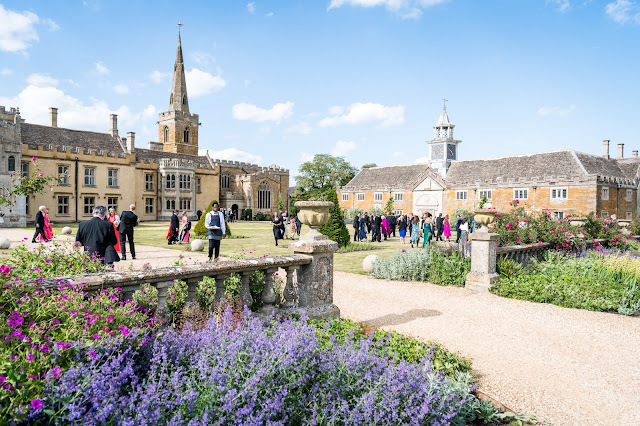 The philosophical ideas of the libretto fuse Christianity and Buddhism but the trappings of Wolfram von Eschenbach’s 13th-century poem - focusing on the Arthurian hero Parzival and his long quest for the Holy Grail - are essentially Christian based. The composer actually described Parsifal as ‘ein Bühnenweihfestspiel’ (A Festival Play for the Consecration of the Stage) not an opera thereby underlying the deeply-religious overtones the work harbours. Herr Laufenberg sensitively tackled this issue head on especially at the end of act one where one witnesses Amfortas, wearing a crown of thorns and covered only by a loin-cloth, re-enacting the Crucifixion with members of the Brotherhood (now seen as a community of Christian monks) gathered closely round him receiving Holy Communion and partaking of the Blood of Christ. 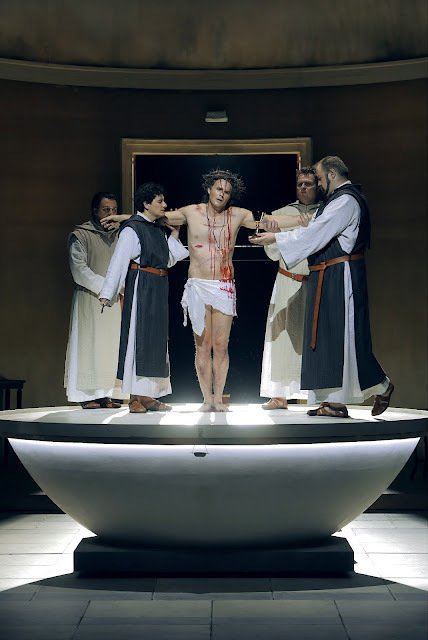 It was a powerful and moving scene while the Christ-like figure of Amfortas was magnificently portrayed by the gifted and talented American bass-baritone, Ryan McKinny. However, Herr Laufenberg, working in partnership with dramaturg Richard Lorber, turned the production upside down and inside out by dumping the traditional setting of Montsalvat - the revered castle of the knights of the Holy Grail in medieval Spain - and switching it to Islamic State’s Middle Eastern-held territory of northern Iraq where Christianity (and so much more) is under threat as never before. Therefore, a bomb-scarred and badly-damaged church provided the setting for the first act but its sanctuary lamp - commonly used in Christian and Jewish centres of worship - remained, surprisingly, intact. Here the monks go about their daily business of serving the needs of the homeless brought about by the ravages and misdeeds of war with families of mixed faiths sleeping on field hospital-type canvas beds as befitting a refugee camp and kept under tight surveillance by a small battalion of battle-dressed armed soldiers. Dominating their prison-type space was a huge circular basin used as a healing bath for Amfortas. Overall, the opera was well cast. German bass, George Zeppenfeld, delivered a solid and authoritative performance as the veteran knight, Gurnemanz (a role he has sung many times), Andreas Schager was exemplary as Parsifal and Russian soprano, Elena Pankratova, sang Kundry (in which she made her Bayreuth début last year) in a passionate, well-acted and thrilling performance. The church-like setting of act one was turned into a mosque for act two simply by adding a blue-decorative glazed-tiled wall plus other minor decorations while the evil sorcerer, Klingsor - sung menacingly by Australian bass-baritone, Derek Welton - dominated proceedings in this act cavorting about the place as the ‘king of the castle’ and fussing about (and hiding) in his reliquary towering high above the stage stuffed with crucifixes by the dozen. But all good things come to an end and in the scene where he hurls the Holy Spear at Parsifal, who miraculously catches it in mid-air, it sees the end of his fun and games. Struck dead on the spot his treasured reliquary dramatically crashed down upon his body. One of the most revealing and colourful scenes of the whole production came with The Flower Maidens scene. It was as dramatic as they come. When they made their entrance, they stormed on to the stage wearing the traditional black-robed Islamic dress of tschabors and burkas, positively hitting the mark in Laufenberg’s realisation. And the point when they tempt Parsifal of the sins of the flesh they quickly discarded them to reveal a more Western-style dress approach attired in brightly-coloured garments and skimpy bikinis. In essence, they could have jumped out of The One Thousand and One Nights. 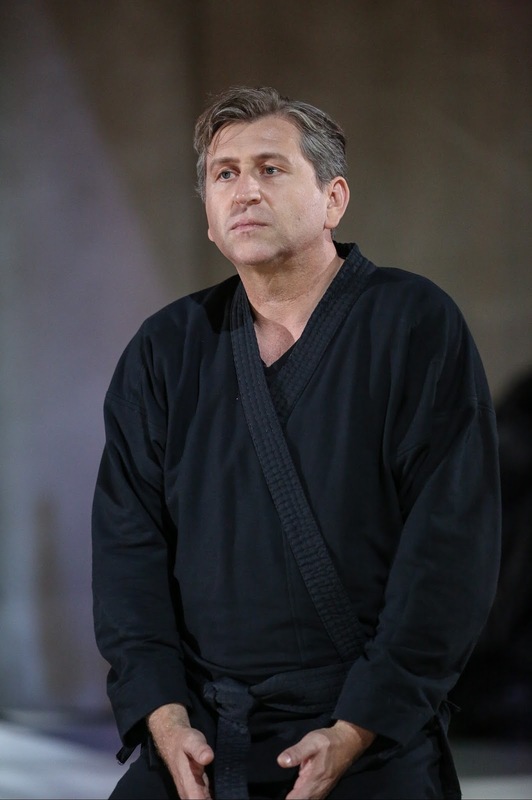 Amfortas’ father, Titurel (Karl-Heinz Lehner), put in a comfortable and rewarding performance and seen at the end of the opera as a withered old man rather than the usual hollow-type voice straining from a coffin. It offered a different approach to this scene which manifested itself by a large group of mourners depositing all sorts of artefacts into the coffin as a sign of redemption. And as the scene quietly unfolded the lights of the vast auditorium of the Festspielhaus were slowly heightened to full glow (and there are a lot of lights here) thus inviting members of the audience to partake of this redemptive act, too. It was a poignant moment. Another poignant moment came in the last act, too, with Gurnemanz, tired and weary and aided in his mobility by a wheelchair, offering Parsifal his blessing and proclaiming him king. And a most penetrating and rewarding scene unfolded when a penitent Kundry (who suffered endlessly for mocking Christ on the Cross) humbled herself to wash the feet of Parsifal - a tender moment as always. Parsifal’s first task was to baptise her and then struck by the ethereal beauty of Nature surrounding him, punctuated by naked young girls enjoying bathing in an idyllic and natural stream by a waterfall, he listened intently to Gurnemanz explaining the spell of Good Friday where Nature is transfigured by love and innocence is completely regained. Mahatma Gandhi is quoted as saying: ‘The soul of religion is one but it is encased in a multitude of forms.’ Therefore, Laufenberg seems more than justified at the closing stages of the opera in grouping together a trio of faiths - Christians, Jews and Muslims - witnessing Amfortas, old, worldly and weary and longing for death, entering the Hall of the Grail only to be miraculously cured by Parsifal who touches his side with the Holy Spear thus saving the Brotherhood and mankind! But as far as Wagner operas are concerned the orchestra is as important as the singers and under the baton of veteran Wagner conductor, Hartmut Haenchen, the players - hand-picked from some of Germany’s finest musicians - more than rose to the occasion. 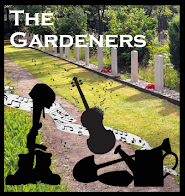 They excelled themselves and were heard to good effect in the prelude to act one based on motives heard in The Love Feast and The Spear as well as the ‘Dresden Amen’ representing the Holy Grail while the Transformation Music in the same act was brilliantly executed. The ‘Dresden Amen’ was, in actual fact, composed by Johann Gottlieb Naumann for use in the Royal Chapel at Dresden. But such was its popularity that it took Saxony by storm and used by Catholics and Lutherans alike. Wagner also incorporated the piece in Das Liebesverbot (one of his earliest operas) and, indeed, drew upon it for the third act of Tannhäuser. And let’s not forget the members of the chorus who, under the guidance of Eberhard Friedrich, put in some hard and diligent work. Under his leadership at Bayreuth he has trained the chorus to one of the best. Their curtain-call was glorious with Herr Friedrich leading and running excitedly with them from the full depth of a very deep stage to wild and thunderous applause. There were so many of them that it mirrored the start of a Marathon!